Freelancers, contractors, contingent workers, gig workers, independent workforce. However you prefer to call this segment of the workforce, more than 40% of U.S. working adults are currently freelancers or have worked as a freelancer in the past. That share is expected to increase to cover half of the U.S. adult workforce, according to MBO Partners’ 2017 State of Independence in America report, its seventh annual study of the U.S. freelance workforce. The U.S. freelance economy has grown exponentially in the past decade, as new work intermediation platforms popped up, connecting workers who can provide a given service with people willing to pay for that service. The lingering effects of the Great Recession, which left 8.7 million workers unemployed, also gave a boost to the freelance economy. In fact, freelance workers now generate $1.2 trillion in revenue for the U.S. economy, accounting for roughly 6% of national GDP. Let’s first take a look at three trends that MBO Partners’ report details. Let’s start with the good news first. The percentage of high-earning full-time freelancers (defined by MPO Partners as earning more than $100,000 annually) has increased 4.9% since 2016 to almost 20% of the overall full-time freelance population. There are about 3.2 million full-time freelancers who fall into the high-earner category, a number that has steadily risen over the past six years. 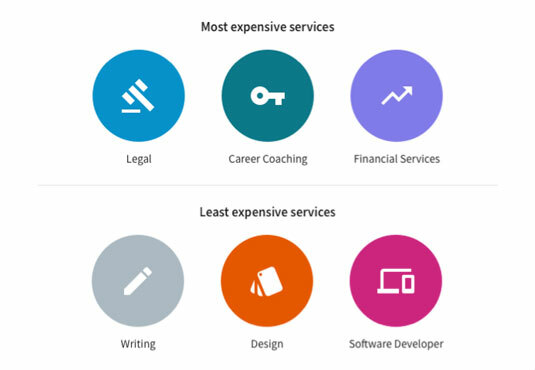 The average income for full-time freelancers is $65,300. The freelancing boom is in part caused, however, by stagnating wages. According to the Pew Research Center, inflation-adjusted wages have not increased for more than 40 years. In response, more Americans are supplementing their payroll jobs with side gigs, working through platforms such as Uber or TaskRabbit. The number of “occasional” freelancers, or people working “irregularly or sporadically as independents but at least once per month,” has increased 23% since last year, to 12.9 million. The previous two trends have led to what MBO Partners called a “barbell effect” in freelance wages, with the lowest-paid and the highest-paid ends of the freelance work spectrum have seen the biggest growth. Among the high-paid freelancers, you have consultants in areas like technology, design or procurement, and on the opposite end of the spectrum, there are the TaskRabbits who work odd jobs for some extra pay — of which TaskRabbit takes a 30% cut. Demographic data for the U.S. freelance population have stayed more or less constant. As is the case for the general U.S. workforce, millennials are making up a growing share of the freelance workforce, at 38%. That the freelance workforce has higher levels of formal education than the general workforce has also been an enduring trend. About two in five freelancers have at least a four-year college degree. This year, 65% of freelance workers said that pursuing such work was entirely their choice and not due to external factors such as layoffs or illnesses, the highest level in the seven years that MBO Partners has been conducting this study. In comparison, that figure was 59% in 2016. Only 9% pursue freelance work due to external factors, the lowest level in seven years. This may be a reflection of economic recovery, as employment bounces back to prerecession levels. One notable difference from 2016 has been increased preoccupation over health care and other benefits. While in 2016 only 33% expressed concern over health care, that percentage has jumped to 40% this year. A likely explanation is the potential repeal of the Affordable Care Act, which would eliminate the health insurance marketplace that many freelancers rely on for coverage. In short, the U.S. freelance economy is humming along. For workers who place a high premium on flexibility and are more entrepreneurial and less risk-averse, the freelance career can have a lot to offer. Freelance workers tend to be a self-selecting population. If you can have more flexibility and a higher income working independently rather than for a company, why not join the 40%?